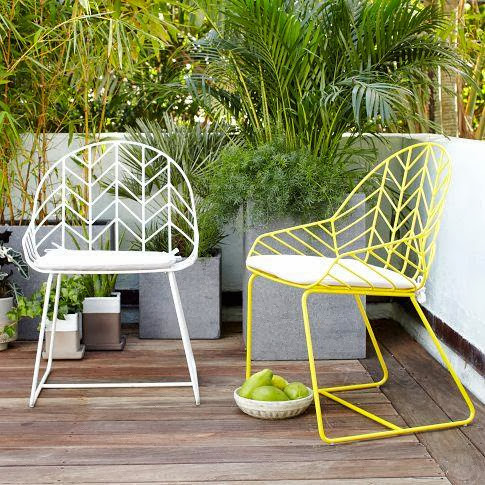 There's so much to love about outdoor wire furniture: it doesn't obscure the garden view, is sculptural, long-lasting and is nearly always well priced. These newcomers from West Elm in Sydney, and now in Melbourne, are designed by Los Angeles-based entrepreneur Gaurav Nanda who apparently left his corporate job as a designer for General Motors to found furniture design house Bend. Inspired by the iconic 1950s' work of sculptor Harry Bertoia, these powder-coated steel dining chairs feature a wiry web of metalwork to evoke classic line drawings. Plus, they are both comfy and contemporary, making artful statements indoors and out.